In Part 1 of this review, I walked through the deployment and initial configuration of the Unitrends Free backup appliance. I’m now going to touch briefly on some of the other features of the product before summarising my thoughts. There’s no point taking backups if they don’t work, right? Well there are a few options available here. The first of them is a file level recovery. This mounts a VM’s backed up disks as file shares on the backup appliance. To test it, I created a couple of test VMs to backup and selected to restore from one. A file level recovery “job” is started and a share is created using the backup job number. It’s pretty easy to browse to the share and the required files could be recovered from there. Another restore option is an Instant Recovery. This creates a new virtual machine from the stored backups for a VM. Again, I tried it out on my test VM. The first step is to select the backup that you want to restore from. Next up are the recovery options. I’ve selected “Audit Mode”. This creates a virtual machine that runs from a disk image located on the backup appliance. The intention is that it allows you to test if a recovery is possible without putting the VM back in to your virtual datacenter. The VM in Audit Mode will have no network connectivity. It took a few minutes to create and boot up but it worked. Note that the VM has no network connectivity. There were a couple of little annoyances that cropped up during my testing. They may already have been fixed and none of them are major. Firstly, when trying to configure SMTP settings, each time the configuration dialog is opened, a new email recipient row is added – even if that’s not what I opened it for. And you can’t close the window until you remove the row (or add an email address). Quite a few of my VM backups failed several times to begin with so I checked to see if there were any software updates via the update feature. Lucky me, there were. But after closing the dialog and reopening it, they were gone. I had to reboot the appliance to get them to show up again. After applying the updates my backups were more reliable (although one of my Active Directory servers still refused to backup). I used my own, local NTP server. It’s open and reachable from the network that I installed the Unitrends appliance to. But, when I viewed the appliance options… not there. I noticed this due to the discrepancy between the times that I thought I had configured backup jobs to run and the time that they were running. Fortunately, changing the options via this dialog worked. The initial installation and configuration only allows you to specify a primary DNS server. Personally, I’d prefer it if I could specify a secondary DNS server at installation time. You can add one later though. It’s easy to fix manually of course, by annoying. I might see if I can schedule a vRO workflow to take care of it. It’s not perfect (what software ever is). Aside from the issues I had above, the only other thing that bothers me a little is the installer. It’s delivered as a single .EXE file that is 2.2Gb in size. The process, once the file is open, is fine but it can take a while to open a file that big. Possibly, given who is likely to use Unitrends Free, it might be the simplest option. It’s just not the quickest. As far as features go, the important ones are there. VMs can be backed up and restored. Individual files on a VM can be easily recovered as well. If you have a small Virtual Infrastructure, the sizing limitations aren’t likely to be an issue. And if you get bigger, it’s not unreasonable to pay for more features and capabilities. On the whole, kicking the tyres on Unitrends Free has been a pleasurable experience. It was fairly easy to setup and use without having to read the manual. I was asked to give a new, free backup tool a quick road-test recently. Unitrends have had an Enterprise version of their backup software for some time. And, as I’ve used it a bit in my lab with an NFR license in the past I was only too happy to give Unitrends Free a go. As a free edition, you expect a basic set of features. The goal of such offerings is normally to get you hooked, but wanting more. There are limits however. For instance, backups are scheduled daily. You can choose the time and you can choose the days but they’re once per day. Storage is space is also limited, up to 1TB of data is supported. These limitations position the product as ideal for PoCs, labs, smaller deployments (such as for small businesses) etc. For more features and dedicated support, of course there’s the Enterprise version. To download Unitrends Free, a simple registration form needs completing on the Unitrends site. The software is offered as a pre-built appliance (there’s one download for VMware and one for Hyper-V) only that is comprised of a single file. There are also users guides and release notes files available. As you’d expect with a solution that’s based on a Virtual Appliance, there aren’t many steps involved in getting it deployed and running. In keeping with a growing number of products that provide some form of installer to deploy their solution, Unitrends Free is packaged in such a way as to make deployment straighforward. The supplied single executable (.EXE file) can be run from a Windows desktop or server as long as you can reach your virtual infrastructure from it. 1. Once the installer starts, you’re presented with a prompt for login credentials to vCenter or an ESXi server. 2. I pointed the installer at my vCenter server and was next asked to choose a host and a datastore and supply IP address details (note that it’s sensible to have a DNS entry created prior to deployment). 3. You’re given the option to create some storage for backups to reside on during deployment. It’s turned on by default but I upped the default 128Gb to something more sensible. 4. That’s it for now and deployment commences. 5. A quick check in vCenter reveals the created appliance. That’s all that’s required to install the appliance. However, it does require some basic configuration before it can be used. 1. Clicking Finish in the installer fires up a web browser pointed at the new appliance where you’re greeted by a License Agreement. 2. You’re then greeted by a configuration wizard. The first stage is setting the date and time. I chose to use my local NTP server, although this later transpired to be an issue. 3. The second stage is setting the hostname (note that it’s set to VMware_CE_UEB on deployment) and password for the root account. 4. Finally, the SMTP configuration is required. Once these configurations are saved, the appliance should be all set to go. Except we need to define what needs protecting and to setup some backup jobs. What use is a backup appliance without any backup jobs? When you first hit the appliance’s dashboard, there’s a popup displayed containing a couple of tasks that help you to get started. The first of these is registering a host (to protect). Since we already know that I’m using vCenter, let’s protect that and all of its VMs by clicking on “Register a Host”. The details required are fairly straightforward. As part of the process of adding the host, a quick inventory is performed. Now we’re ready to create a backup job. This is accomplished either from the same popup or via the “jobs” option on the left of the dashboard. Step 1 of creating a backup job is choosing what you’re going to backup. I selected my vCenter server and then excluded the Unitrends appliance – it’d be interesting to find out if it’s intelligent enough to do that by itself later. Step 2 is defining the schedule etc. This is all fairly simple to accomplish. In theory, that’s my lab VMs protected. Fast forward to Part 2 to find out how I got on with the backups and my thoughts on the solution as a whole. The Synology DS1512 has been a popular choice for many home labs in recent years. I hoped that the company’s raft of recent product updates would reach this model eventually. Well my wish was granted as Synology have announced the DS1513+. The full specifications for the DS1513+ can be found here. HP have recently updated their Proliant Microserver to sport a slightly nippier processor. As well as the 250Gb SATA drive it also now comes with 2Gb RAM as standard – although if you’re thinking of using one for a home lab Virtual Infrastructure you’d need to replace that with 2 x 4Gb sticks anyway. HP’s ongoing cashback deal for this little gem is still running too. Before cashback they’re about £200 + VAT meaning that once you get your cheque back from HP, they work out at only £120 each. Not bad at all for a home lab and the AMD NEO N40L 1.5Ghz dual-core processor should be enough to handle a reasonable lab-like load. ServersPlus are one of the places in the UK to pick one of these servers up. They even offer an ESXi 5 testbed bundle that includes the 8Gb RAM and an optical drive. These little servers are great lab servers if you need something small and quiet. I have 3 of them running more or less full time at home and my wife hasn’t complained about the electricity bill… yet. I’m not normally in the habit of posting this sort of thing but I do own a number of these MicroServers and they’re great for home lab use. They may only take up to 8Gb RAM and have single, dual-core chips in them but they don’t eat much power and don’t make much noise. They’re also as “cheap as chips” to buy! Enough about why I have them. ServersPlus are running a competition of sorts to design a cosmetically pimped up MicroServer. If you submit what becomes the winning design you get the first one of the batch for free. Submissions have to be in on 11th November and voting runs until 30th November. I thought that I should mention the Hands-on-Labs in a separate post because they were very slickly implemented and managed, a testament to the people who put them together. Not only that though, it was VMware eating their own dog food in a very public way and, in my opinion, showing that they were up to the challenge. For those people reading this who haven’t been to VMworld before the Hands-on-Labs (HOL) are an area of the conference where you can work though a series of prescribed tasks to satisfy some requirementsconjured up in a brief scenario. 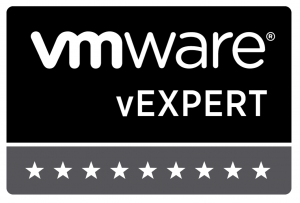 It’s an opportunity for some to try out some of VMware’s products in a meaningful way. In the HOL area, there were 240 seats available, each one equipped with dual 19″ widescreen monitors, a thin client, keyboard and mouse. Lab instructions were displayed on one screen and an RDP session to an isolated and dedicated environment for your chosen lab was displayed on the other. In the centre of the HOL area was a control station for managing the environment and several, large screen displaying statistics for the duration of the conference. This year there were 27 different labs available. I only managed to find the time to complete 3 but there were some people whose entire conference seemed to be taken up with lab sessions. Three of the 27 labs were also “vendor” labs with the emphasis of them being on NetApp, EMC and Cisco. Many of the other vendors exhibiting at VMworld would probably like a specific lab for next year – one even said as much to me. Completing the labs was fairly easy once you were sat down. You simply had to decide which of the 27 you wanted to complete. The instructions were displayed on the right and the RDP screen popped up on the left. All that you then had to do was work your way through at your own pace. I didn’t encounter any problems although there were some differences between different labs in how detailed the instructions were or in how they were laid out. That was a minor issue though. The impressive thing for me was how everything was pre-provisioned and available for each of the thousands of lab sessions that were served during the conference. How it all worked together. Simon Seagrave chatted to me briefly about it at one point and showed me how you could work out which datacenter (Amsterdam, Florida or Las Vegas) your lab was being hosted in. Simply, it was just working out which timezone the RDP session appeared to be in. As you can see below, when I took this lab at about 8.30am, I was working on infrastructure in Las Vegas! Also interesting to note was that VMware were running vCenter Operations Suite 5 (not yet available to download) to monitor the infrastructure. I was offered a short demonstration of it by Bas Raayman (vSpecialist at EMC) but I didn’t manage to find the time to take him up on his kind offer. I also subsequently discovered that VMware had vCenter Operations for View running as well although give the rate at which lab environments were binned and re-provisioned I doubt that they would have got much useful information out of it. I’ve asked quite a few other people what they thought of the Labs but I’d like to know what more people though about them too so please feel free to participate in the poll (in the sidebar) that’ll run through to the end of October 2011. Just in case @kiwi_si hasn’t posted about this, it seems that the cashback offer on HP’s MicroServer has been extended again until the 31st Macrh 2011. Even better, ServersPlus have apparently picked up new stock at a lower price that they are passing on. This means that after cashback that you can get one of these little fellas for under £100 (ex VAT) – sorry, UK only. For further information about these servers, including how well they work in a home lab environment, head over to TechHead. Or, for that low price, you could just buy one and play with it!